Happy Birthday ThingOne (yes, it was really yesterday, but we're telling you it's your birthday today). 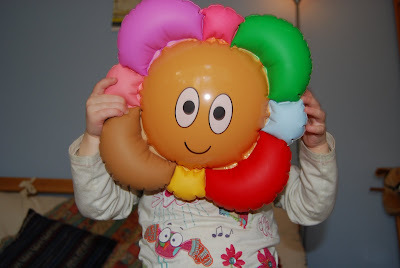 Of course, the hobby horse (we've called Susan) and the play food haven't been as popular as the inflatable Ha-Hoo (from In The Night Garden) I picked up yesterday for £2 with a comic, which has been a big hit. Here you are showing off your Ha-Hoo.